Carl Wayne, the lead singer of influential 1960s pop group the Move, has died at the age of 61. He had hits with songs such as Flowers in the Rain - the first song to be played on BBC Radio 1 when it began in 1967 - and I Can Hear the Grass Grow. Wayne died peacefully at home on Tuesday morning after battling cancer. He was born on 18 August 1943 in Dudley Road Hospital, Birmingham. 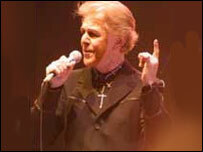 After the Move, he enjoyed success with the Hollies when he joined them in 2000. The Hollies manager, Jimmy Smith, told BBC Radio WM - where Wayne had also worked as a presenter - his death had come as a great shock to the whole band. He said: "We are shocked by it because we didn't expect it to be so sudden. "We have got a tour in the autumn and he was looking forward to coming back and joining us. "His wife called me on Friday to say he was ill but wanted to keep it quiet while there was hope, and we were all hoping." The Hollies' drummer Bobby Elliot said: "The Hollies and the world of music have lost a shining star, a true professional. It is a very sad day for the band. "Our thoughts and prayers go out to his wife Susan, son Jack and all of his family. "Carl was one of the music business's great characters. He was a fearless performer and a powerhouse singer. It has been an honour to work with him. "I shall remember his five years with The Hollies with great pride and affection."